This story appears in the Spring 2019 issue of Sports Spectrum Magazine. 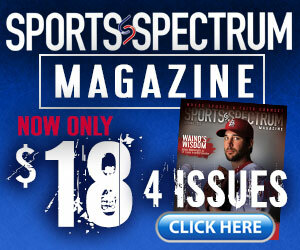 To read the rest of it, and for more in-depth feature stories like it, subscribe to our quarterly magazine for only $18. 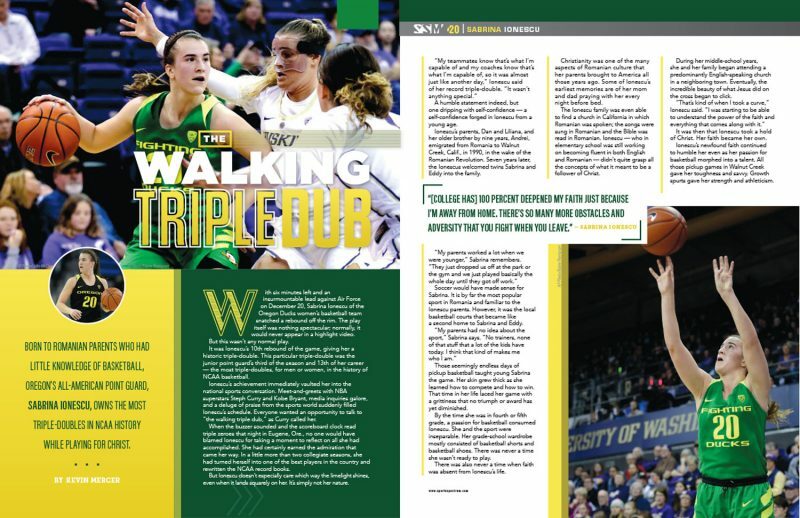 BORN TO ROMANIAN PARENTS WHO HAD LITTLE KNOWLEDGE OF BASKETBALL, OREGON’S ALL-AMERICAN POINT GUARD, SABRINA IONESCU, OWNS THE MOST TRIPLE-DOUBLES IN NCAA HISTORY WHILE PLAYING FOR CHRIST. 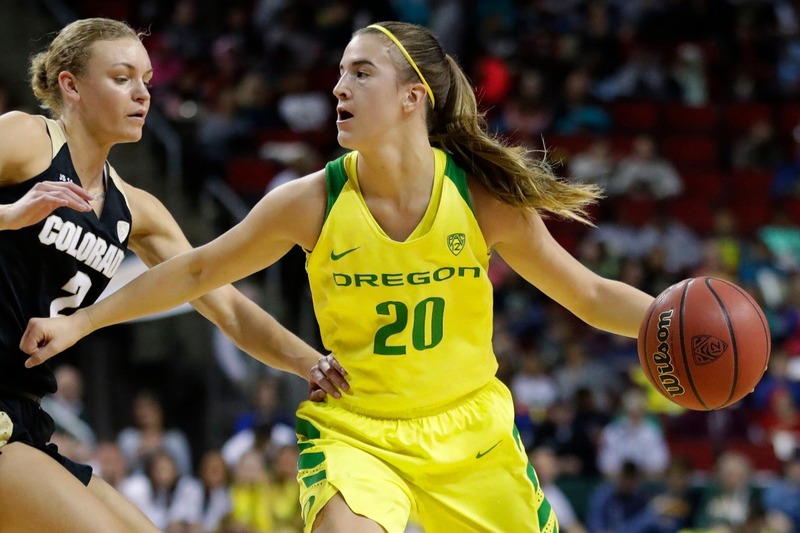 With six minutes left and an insurmountable lead against Air Force on December 20, Sabrina Ionescu of the Oregon Ducks women’s basketball team snatched a rebound off the rim. The play itself was nothing spectacular; normally, it would never appear in a highlight video. But this wasn’t any normal play. It was Ionescu’s 10th rebound of the game, giving her a historic triple-double. This particular triple-double was the junior point guard’s third of the season and 13th of her career — the most triple-doubles, for men or women, in the history of NCAA basketball. Ionescu’s achievement immediately vaulted her into the national sports conversation. Meet-and-greets with NBA superstars Steph Curry and Kobe Bryant, media inquiries galore, and a deluge of praise from the sports world suddenly filled Ionescu’s schedule. Everyone wanted an opportunity to talk to “the walking triple dub,” as Curry called her. When the buzzer sounded and the scoreboard clock read triple zeroes that night in Eugene, Ore., no one would have blamed Ionescu for taking a moment to reflect on all she had accomplished. She had certainly earned the admiration that came her way. In a little more than two collegiate seasons, she had turned herself into one of the best players in the country and rewritten the NCAA record books. But Ionescu doesn’t especially care which way the limelight shines, even when it lands squarely on her. It’s simply not her nature. A humble statement indeed, but one dripping with self-confidence — a self-confidence forged in Ionescu from a young age. Ionescu’s parents, Dan and Liliana, and her older brother by nine years, Andrei, emigrated from Romania to Walnut Creek, Calif., in 1990, in the wake of the Romanian Revolution. Seven years later, the Ionescus welcomed twins Sabrina and Eddy into the family. Soccer would have made sense for Sabrina. It is by far the most popular sport in Romania and familiar to the Ionescu parents. However, it was the local basketball courts that became like a second home to Sabrina and Eddy. Those seemingly endless days of pickup basketball taught young Sabrina the game. Her skin grew thick as she learned how to compete and how to win. That time in her life laced her game with a grittiness that no triumph or award has yet diminished. By the time she was in fourth or fifth grade, a passion for basketball consumed Ionescu. She and the sport were inseparable. Her grade-school wardrobe mostly consisted of basketball shorts and basketball shoes. There was never a time she wasn’t ready to play. There was also never a time when faith was absent from Ionescu’s life. Christianity was one of the many aspects of Romanian culture that her parents brought to America all those years ago. Some of Ionescu’s earliest memories are of her mom and dad praying with her every night before bed. The Ionescu family was even able to find a church in California in which Romanian was spoken; the songs were sung in Romanian and the Bible was read in Romanian. Ionescu — who in elementary school was still working on becoming fluent in both English and Romanian — didn’t quite grasp all the concepts of what it meant to be a follower of Christ. During her middle-school years, she and her family began attending a predominantly English-speaking church in a neighboring town. Eventually, the incredible beauty of what Jesus did on the cross began to click.